Werling's has been a family business since being established in 1886. We take great pride in our work and it shows. You can now take the opportunity to purchase our canned meats directly from our plant. Canned meats shipped to you by the same family (and hands) that produced them. 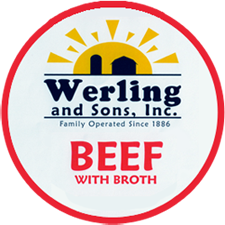 Werling and Sons Inc. established in 1886, have been providing residents throughout Ohio with high-quality canned meat. Our online store offers canned beef, chicken, turkey and pork to customers across the country. There is nothing more important to us than offering premium, canned meats at affordable prices. We stand behind our products 100%, and we are committed to exceeding our customers’ expectations. We have a wide variety of products available including hamburger, seasoned pork and taco beef filling. Regardless of the meat you order from us, expect to receive premium great tasting meat. With decades of experience behind us, our family owned and operated business knows how to treat customers. If you have any questions or you would just like to learn more about our products, contact us today. Place your order online or visit our physical location to browse our selection! Check out what other people are saying about our Canned Meat. Click here. Werling Meats makes it easy to purchase our fine products with streamlined shipping. Your order ships for free! We are 100% committed to customer satisfaction and service and we are devoted to supplying the finest quality beef, pork, chicken and turkey at the best prices! If you have any questions about our products or would like a brochure, please call (419) 375-0037 or e-mail. Don't get stuck in a jam! Werling & Sons canned meats are a must have in any type of emergency or disaster situation. Take advantage of our bulk shipping savings and be prepared.